You can target 1 "Marincess" card in your GY, except "Marincess Marbled Rock"; add it to your hand. You can only use this effect of "Marincess Marbled Rock" once per turn. 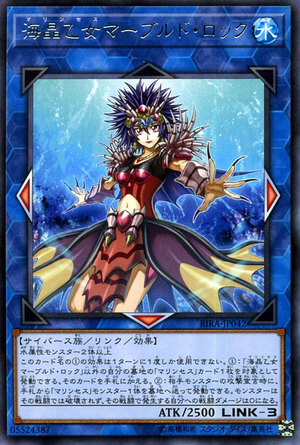 When an opponent's monster declares an attack: You can send 1 "Marincess" monster from your hand to the GY; monsters cannot be destroyed by that battle, also you take no battle damage from that battle.